At the end of the thirteenth century, Edward I (1272-1307), with large estates in France to protect, needed ships to transport his army across the Channel. In 1278, he gave the Cinque Ports a Charter, which encapsulated their role, function, and recognised their importance to the realm. The Cinque Ports are the ports of Hastings, Romney, Hythe, Dover and Sandwich, and the two Antient towns of Winchelsea and Rye and at this time, they were at the zenith of their power. The Portsmen, as they were called, were not averse to raiding, piracy and wrecking. In fact, they attacked passing ships that appeared vulnerable regardless of which country they belonged to! Be they French, English or from anywhere else they were all equal prey. They also attacked Continental ports and killed inhabitants who got in their way with importunity. At sea, they were equally as ruthless, throwing the crew overboard in order to take possession of the spoils. In other words, they were not a god-fearing lot but a bunch of thugs! 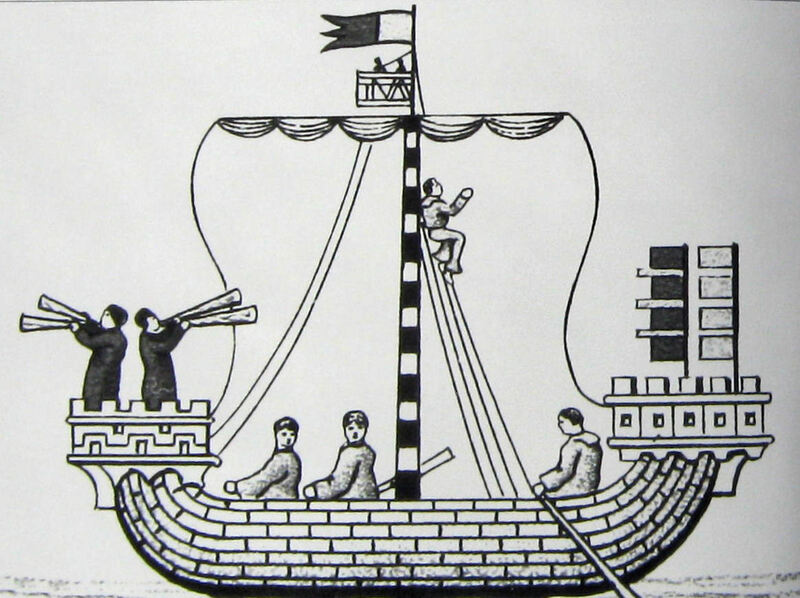 In 1291, for once England and France were not at war, but the Portsmen were as usual pillaging the French coast. Edward had, the previous year, lost his beloved wife Eleanor of Castille (1241-1290), and for political reasons was looking at Blanche (1278-1305), sister of Philip IV (1285-1314), of France, as her successor. He therefore called for a Commission of Inquiry to look into the Portsmen’s behaviour in the hope that this would make them less pugnacious. However, as the King received one-fifth of the Portsmen’s booty, little came of the Inquiry. Then on 15 May 1293, Portsmen engaged in sea battle, with the French, off Point St Mathieu, Brittany. About 400 vessels were involved and the Portsmen brought many prizes home but not before throwing several thousand Frenchmen over-board to their deaths. They then went on to ransack and raze Cherbourg and sack La Rochelle. Following the Cinque Ports men’s attack on the French ports Philip demanded Edward, as the Duke of Gascony, to go to Paris and make recompense. Edward had inherited the Gascony lands and title from Eleanor of Aquitaine (c1122-1204), the wife of Henry II (1154–1189) and as Duke, he was effectively a vassal of the French King. Indeed, not long after Philip ascended the throne Edward paid homage to him for diplomatic reasons but this time Edward refused to see Philip. The French King therefore declared that Edward had to forfeit Gascony. As for Blanche, she was betrothed to someone else. In 1294, Edward embarked on an expedition to recover Gascony and a protracted war ensued. On the night of Tuesday 2 August 1295, the French, with a fleet of 300 ships, landed a force that disembarked under Western Heights and proceeded to set Dover alight. They then ‘Beset the gates of the Convent church (Dover Priory) … they broke them forcibly down and likewise burnt them with fire. Upon entering, they immediately put to a cruel death all the servants they found at large within the precincts‘. The monks fled except for the elderly Thomas Hale (sometimes written Thomas de la Hale/Hayle), who followed his usual routine, ignoring the mayhem around him. However, ‘scarcely had he reached his bed when, lo! The accursed band, led by the men of Calais, followed hard after him’. Apparently, the marauders knew that the Priory’s treasures were hidden somewhere near Thomas’s dormitory and quickly found the recess where ‘books, vestments, cups, censers, basins, vials, relics, charters granted by kings and popes and many other ornamenta,’ were hidden. The aged Thomas tried to stop the plunderers, ‘presuming as they did to handle so irreverently with polluted and unworthy hands the consecrated reliquaries of God’, but to no avail. They then turned on Thomas and demanded that he hand over the treasure. Thomas, so it is written, ‘answered them quietly that he had indeed a treasure, of which they could never rob him, laid up in his heart’, that was, ‘his Lord Jesus Christ and his Virgin Mother.’ Then he was slain with swords, spears and daggers. The Frenchmen left Dover taking back with them some £1,500 of booty as well as precious relics and charters. When the Priory monks returned, they found Thomas’s body and were full of remorse for their cowardice. He was buried with full honours in Dover Priory Church. The following January, John of Pontoise (d1304), Bishop of Winchester, visited the Priory and at the behest of the monks, granted forty days ‘indulgence to all Christian people who would pray for the soul of Thomas Hale.’ This led to Thomas’ tomb becoming a pilgrimage for the devout. The Gascony war proved costly and as part of a truce Edward married Blanche’s younger sister, Margaret (c1279-1318) – Philip IV’s half-sister. As part of the dowry, Philip returned of much of Edward’s inherited lands. In Dover, soon after, miracles were recorded at the tomb of Thomas Hale and in 1370, Archbishop of Canterbury, William Whittlesey (1368-1374), visited. Not long after the widow of the Black Prince (1330-1376), Joan, the Fair Maid of Kent (1328-1385) came to pay her respects. She persuaded her son, Richard II (1377-1399), to ask Pope Urban VI (1378-1389) to include Thomas in the Calendar of Saints. The Pope issued a bull, in 1381, to the new Archbishop of Canterbury, William Courtenay (1381-1396), to take evidence to this effect. However, as pilgrims going to the murdered Archbishop Thomas Becket’s (1162-1170) tomb was a lucrative money earner, Courtenay was less than enthusiastic about the canonisation of Dover’s Thomas Hale. Nonetheless, until the dissolution of the Priory on 16 November 1535, pilgrims still came to Dover. 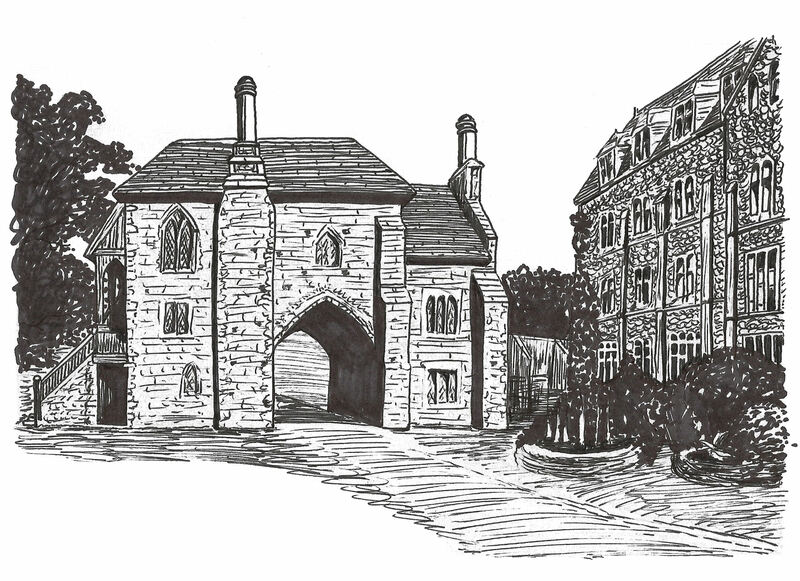 After the Reformation, Dover Priory was rented out as a farm and it is now the site of Dover College. 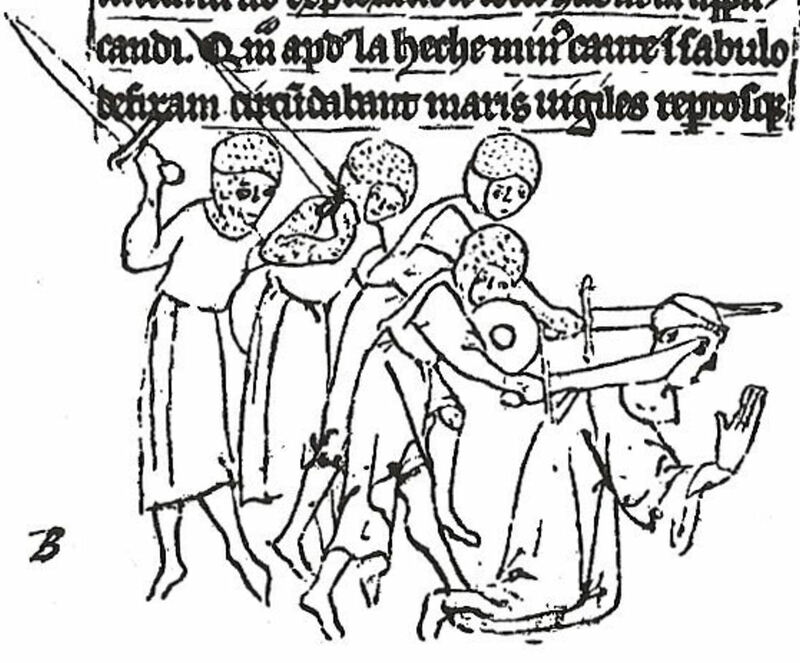 Quotes taken from the “Life and Passion of Thomas de la Hale, Monk of Dover, slain by the French” written in 1377 by John of Tynemouth, which includes the sketch of his death. This entry was posted in Cinque Ports, Hale Thomas - Saint Thomas of Dover, People, Religion & Churches, Saint Thomas of Dover - Thomas Hale, Saint Thomas of Dover - Thomas Hale. Bookmark the permalink.